We’re all having a super pleasant Wednesday today, right? Let’s make it even better. 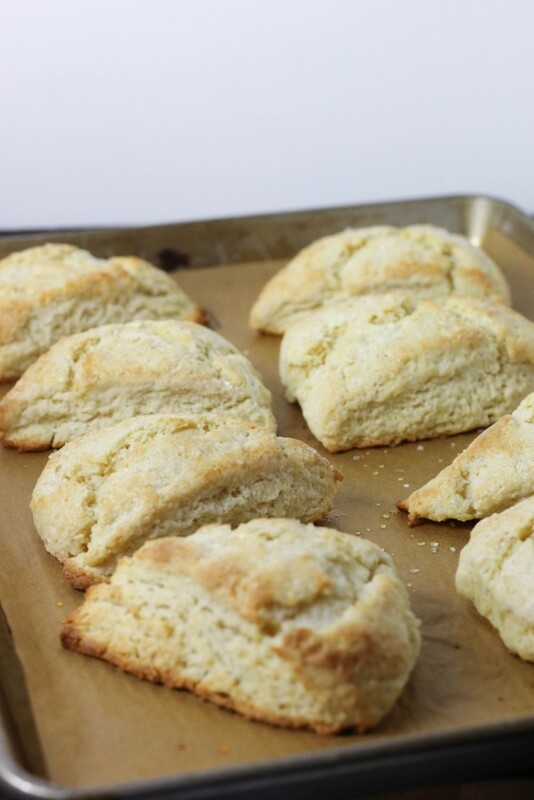 Today I’m sharing another simple, classic recipe with you guys- this time we’re on scones. 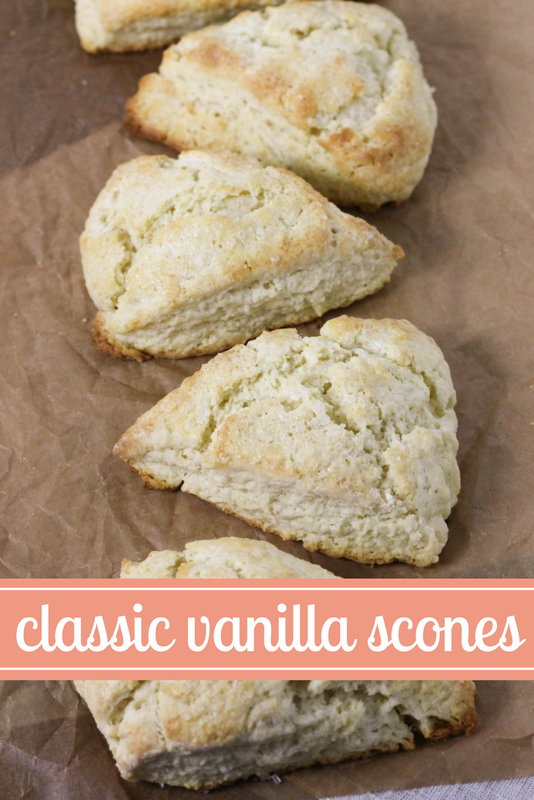 This is a really easy base recipe for scones, and I’m throwing in vanilla for flavor. As per usual, you can do a lot with this recipe. I’ve made it in several variations, and you can find some of those recipes here! You can flavor it with anything you’d like- one version I’ve yet to try is espresso with a maple glaze, I mean can you imagine? Then, turn it out onto a floured surface, and knead in a little more flour as needed to make things less sticky, but don’t over-work it! Pat it into a circle that is about 1/2 inch-3/4 inch thick, and slice it up! I like to brush the tops with a little extra cream and then sprinkle coarse sugar over the top for that perfect little crunch in the end. The sour cream makes these moist and tender, and really the perfect pastry to go with your morning coffee. The best part? You don’t need any special tools, and you can make the whole batch in just a few minutes. 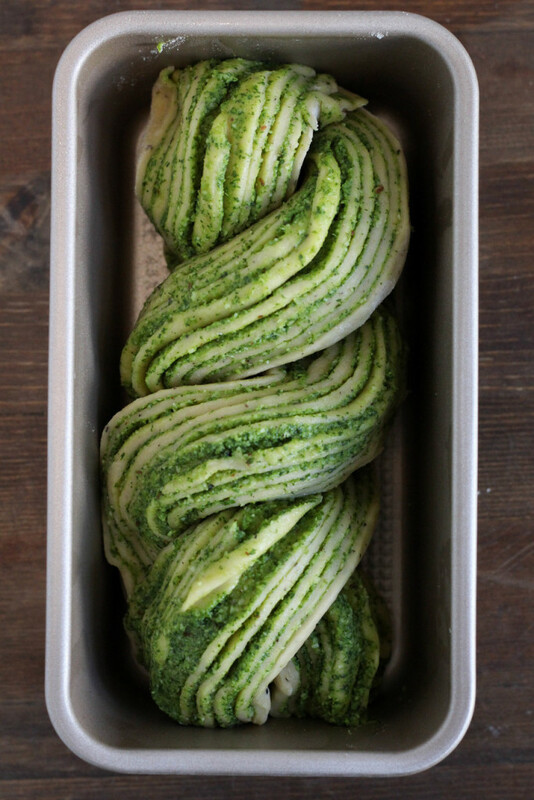 In fact, I suggest you DO make it in just a couple minutes so you can keep things cold before they hit the oven. 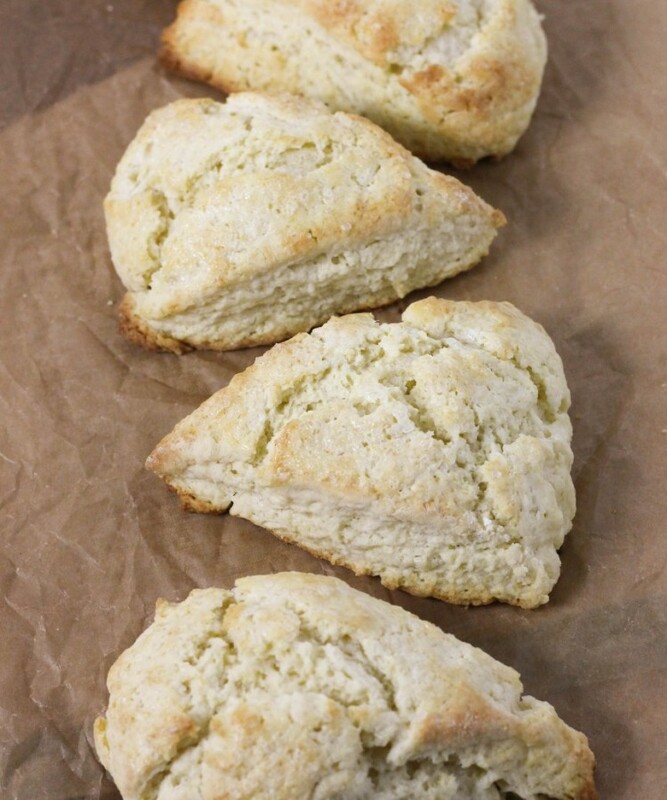 Seriously though, basic scones are a delight. Now, I’ve never been to the UK, and I hear that their scones are incredible compared to those here in America, but these are pretty good if you ask me. Hope you enjoy and experiment with these! 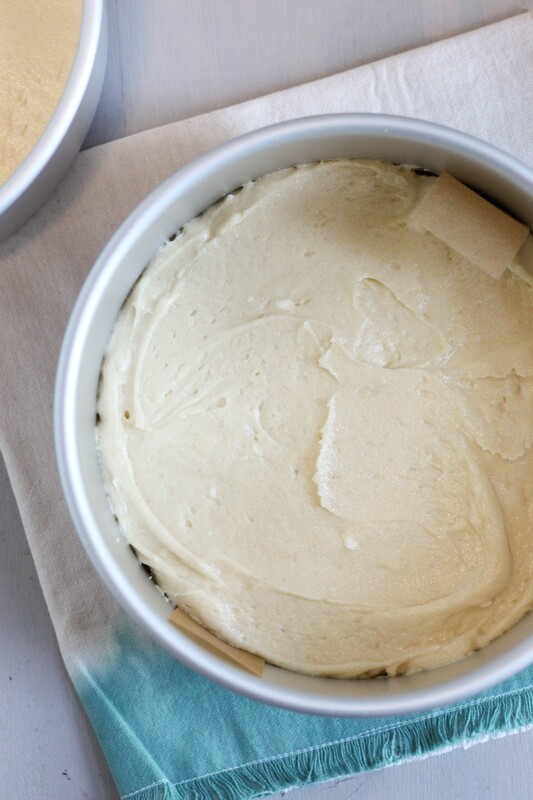 Preheat your oven to 425 degrees, and line a baking sheet with parchment paper. Set aside. In a large bowl, stir together the flour, baking powder, baking soda, sugar, and salt. Using a pastry blender or clean hands, cut the cold butter into your flour mixture until it has coarse crumbs of butter running throughout. In a small bowl, whisk together the sour cream, heavy cream, vinegar, egg, and vanilla extract until combined. Pour the wet ingredients into the dry, and use a spatula to mix until a dough comes together. 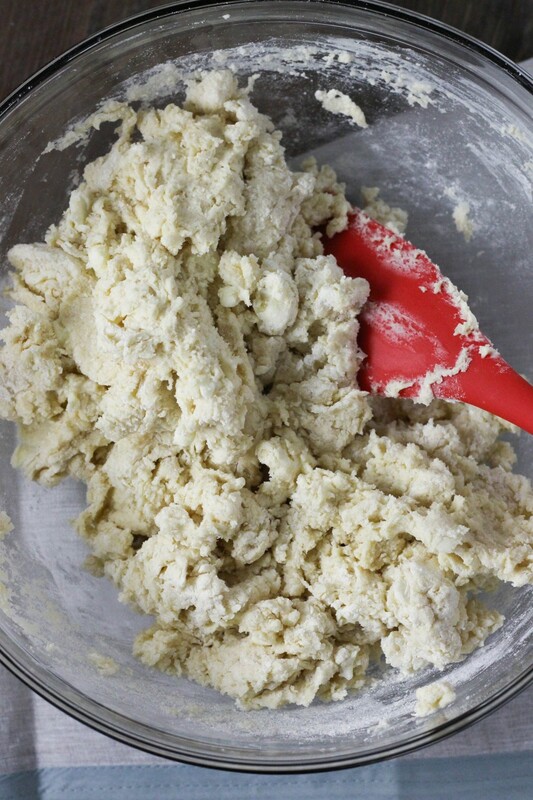 Turn your dough out onto a floured surface, and gently knead it until it just comes together, adding more flour if needed until the dough is not sticky, but still holds together. Pat the dough into a disc about 1/2-3/4 inch thick. 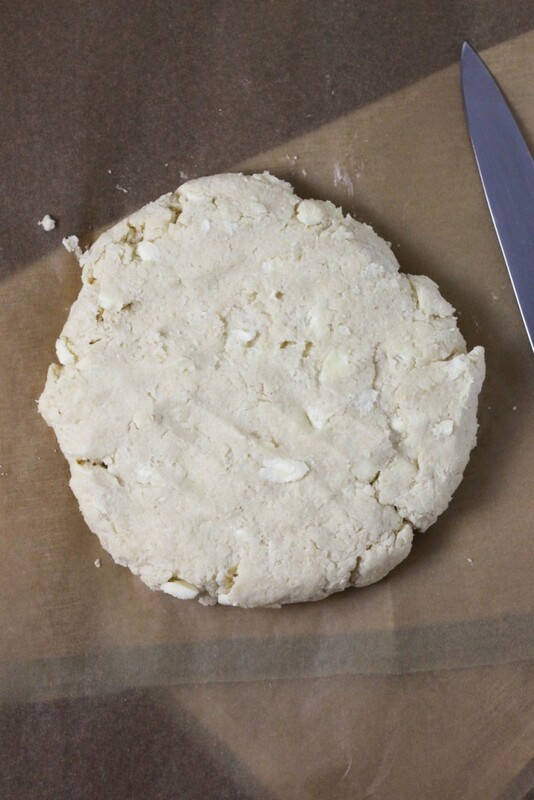 Use a sharp knife to cut it like a pizza into 8 even scones. 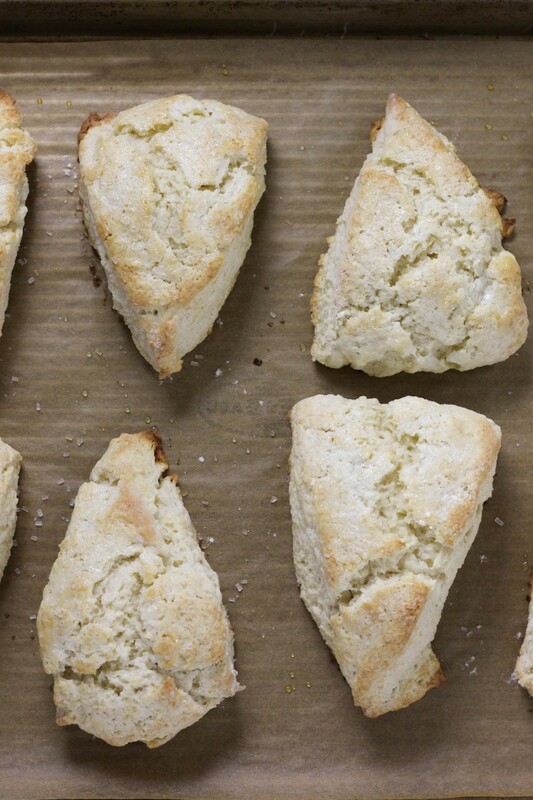 Place your scones onto your prepared baking sheet spaced evenly. Brush the tops generously with cream, and sprinkle with the coarse sugar. 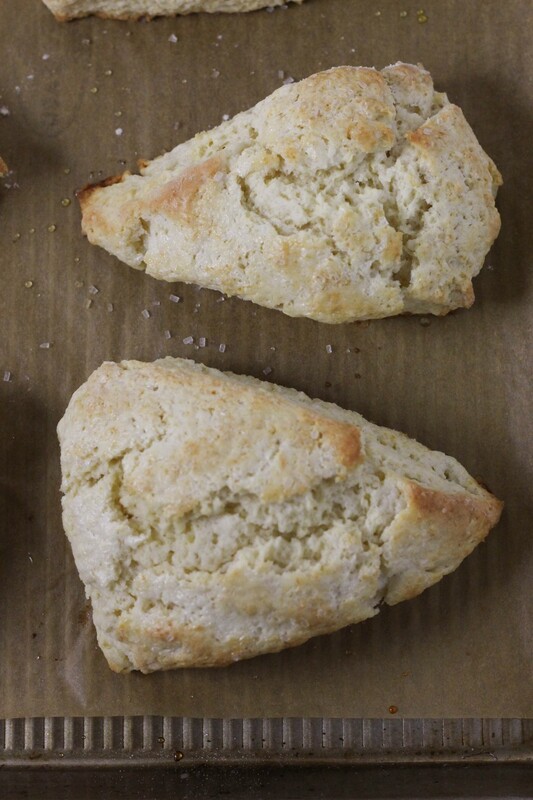 Bake for 10-12 minutes, or until the scones are golden on top. Cool and enjoy! Some of you guys might have noticed that I’m really leaning into simple baking and easy recipes lately. There’s a couple of reasons for this, not the least of which is that we’ve got a 2-month-old baby taking up much of our time now. But I also think it’s really important to build up simple recipes. These are the things that I started baking with when I was younger, and I think for most people, these are the kinds of things that actually get made and eaten. Sure, maybe we want to bake 10 layer stunning cakes sometimes, but in reality, simple baking is at the heart of why we all like to bake. Maybe that’s just me- ha! I also know that baking at high-altitude is tough. 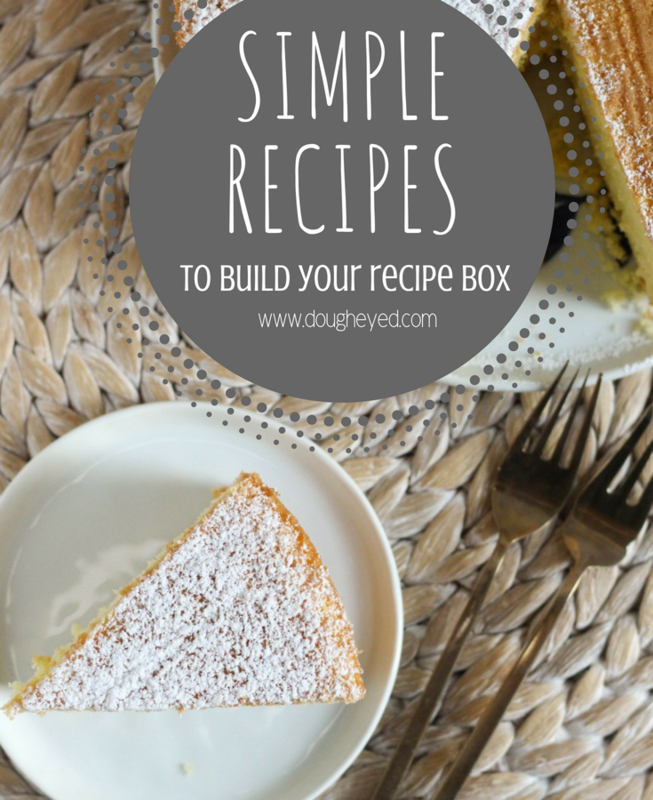 If there is one thing that made it easier for me, it was making the simple recipes work first. Then you’ve got reliable pieces that you can whip up anytime, and you can build from these recipes into other flavors and desserts. So, I’ve decided to make this a series. 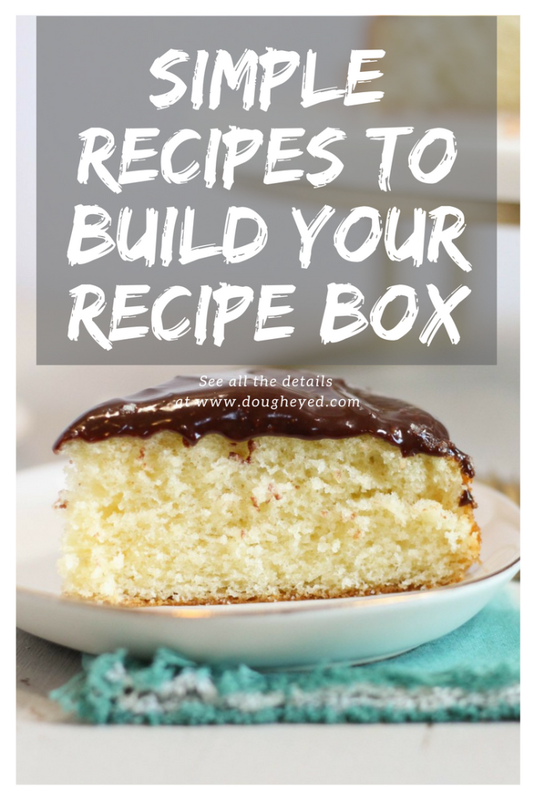 You’ll see the individual recipes coming around as usual of course, and then here I’ll collect them all for easy access and to help you build your recipe box. Btw, do you guys still use recipe boxes? Cause I love them. I own an unreasonable amount of recipe boxes, it’s silly honestly. Alright, here we go, here’s the collection so far, I hope you guys find some great stuff here! 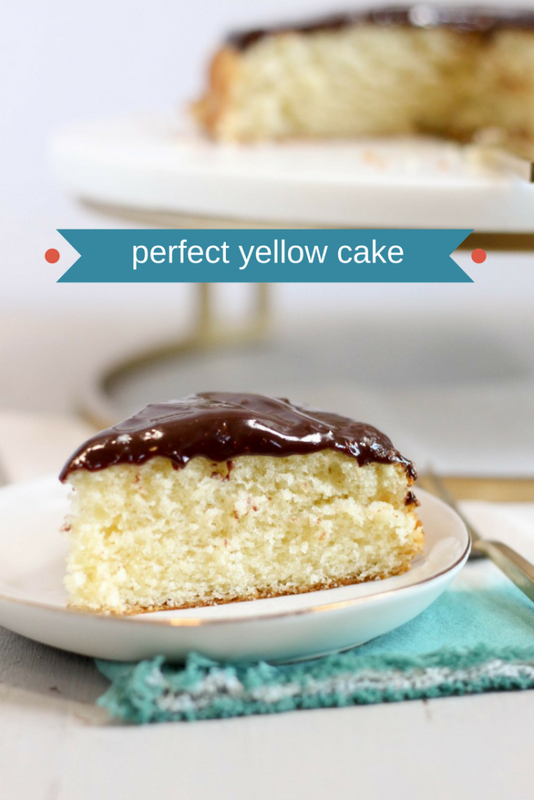 Perfect Yellow Cake – You can use this recipe for just about anything. Feel free to flavor it as you see fit, double and triple it, make cupcakes and crumb cakes and whatever you feel like with it! 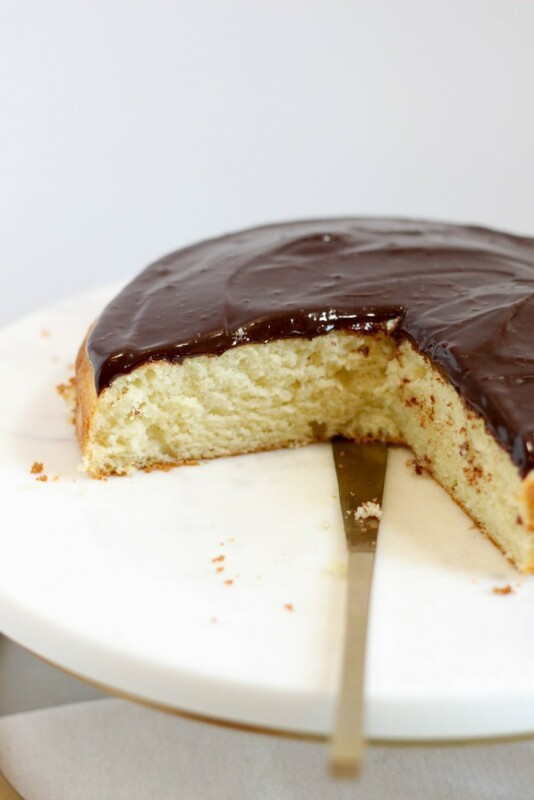 Perfect Chocolate Cake – Chocolate cake is a toughie you guys, especially at high-altitude. Don’t mess around, just get it right on the first try. Vanilla Cupcakes with Chocolate Frosting – Another classic, this is a combo of my yellow cake (turned cupcakes) and a sweet chocolatey frosting. Chocolate Peanut Butter Cupcakes – Chocolate and peanut butter, you know the drill. These cupcakes are not shy about piling that fluffy peanut butter frosting on top. 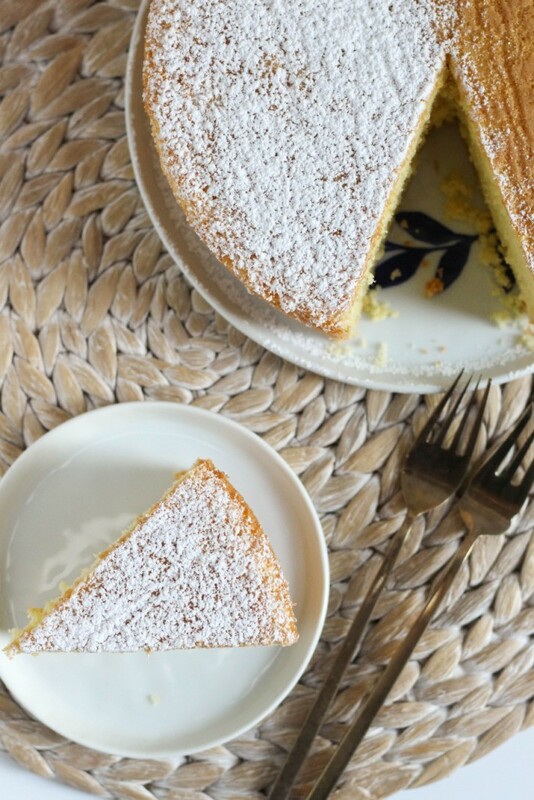 Vanilla Sponge Cake – Sponge cake is really simple, and kind of magic. 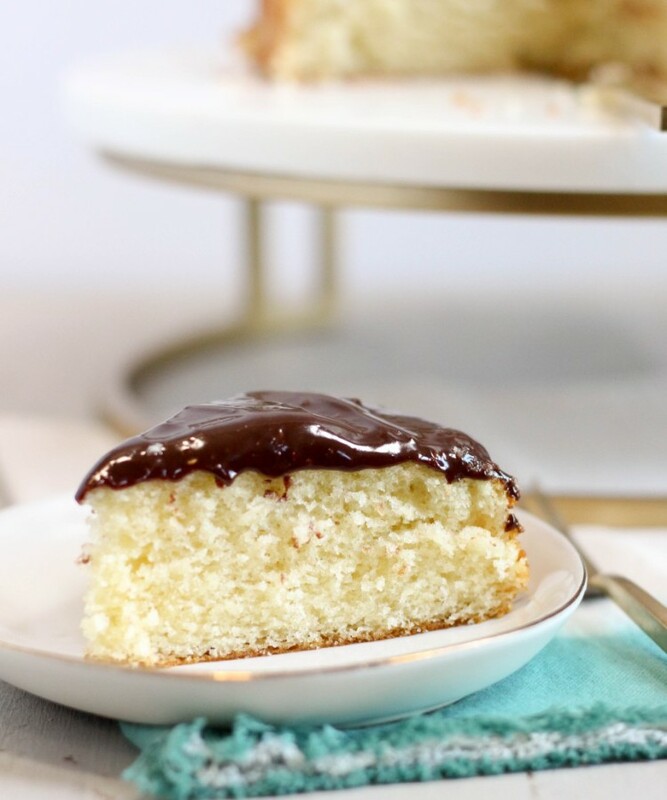 It’s easy to whip up, and it can stand alone, or you can throw fruit or frosting or chocolate on top. 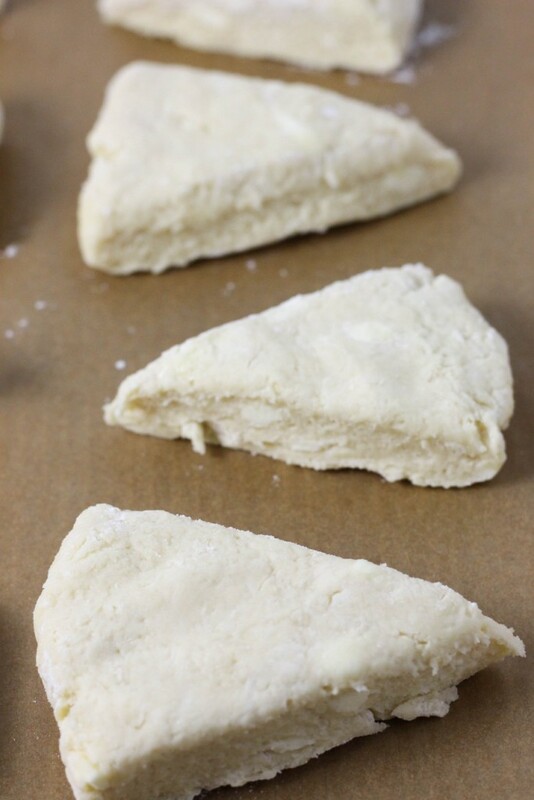 Butter Shortbread Cookies – These are super light and buttery, plus you can use the dough as crust for bars too! Peanut Butter Brownies – Brownies are another tough thing to get right- these are swirled with crunchy peanut butter to bring in the win, and they’ve got that papery top layer that we all love. 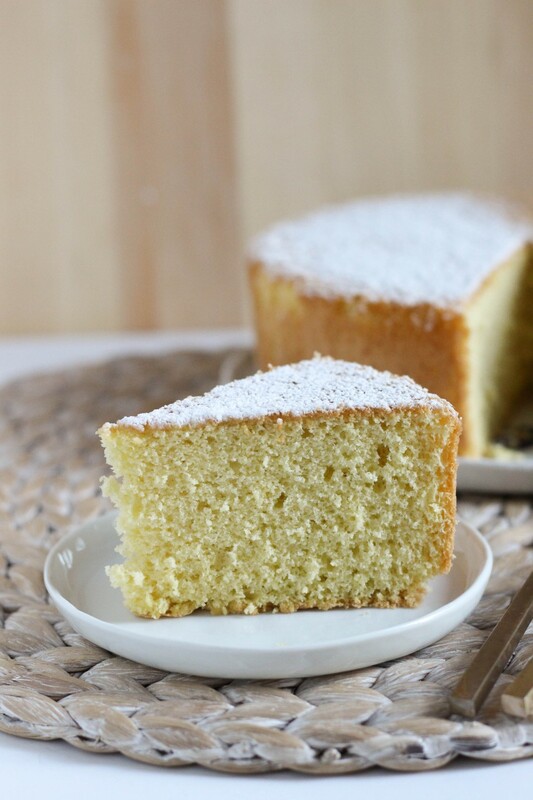 Vegan Pound Cake – This is your classic pound cake, adapted both for high-altitude and for vegan diets. It’s easy, and it’s just as satisfying as the classic! High-Altitude Sandwich Bread – This is a super simple white-bread recipe that will work on it’s own, or as a base for other recipes! Between baby screams and diaper changes, I’ve managed to finally get a little baking done since the little one has joined us. It’s been a struggle to try and feel a little bit normal everyday, but we’re gettin’ there! 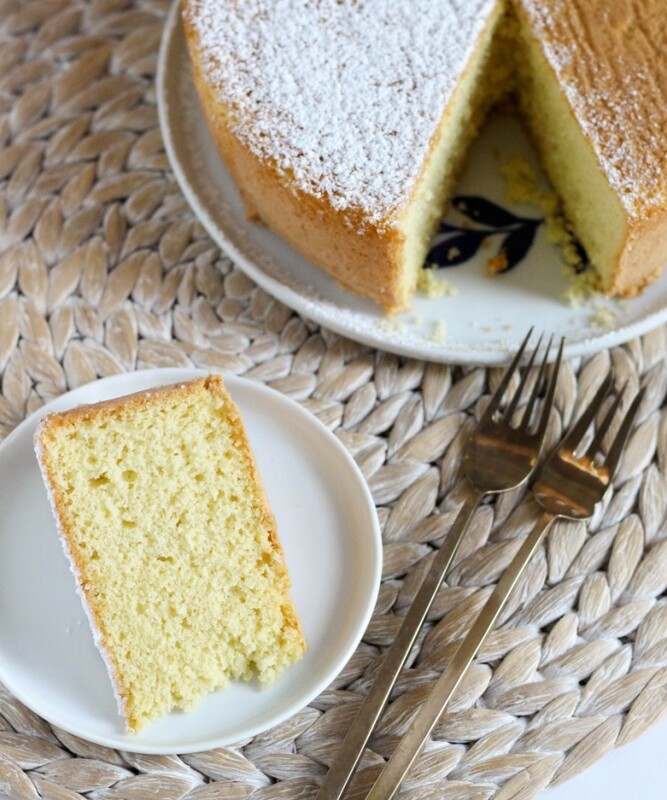 So sponge cake. As with all cake, it gets tough when you’re at a higher altitude. 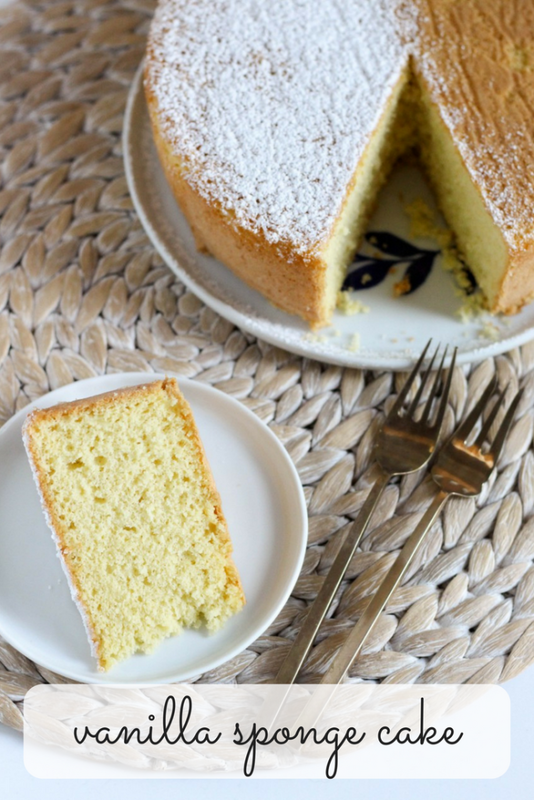 One of the most common issues here is that sponge cake will rise too quickly in the oven, and then collapse in the middle once it’s cooked through. This is because things rise a bit faster during baking up here. To fix the issue, the biggest change is how long you beat your eggs for. Or rather, what your eggs look like when you stop whipping them. You want the mixture to be pale and thick. When you lift your beaters from the mixture, it should drip off, and stand on top of the batter for just a minute before it kind of falls into the rest of the batter. 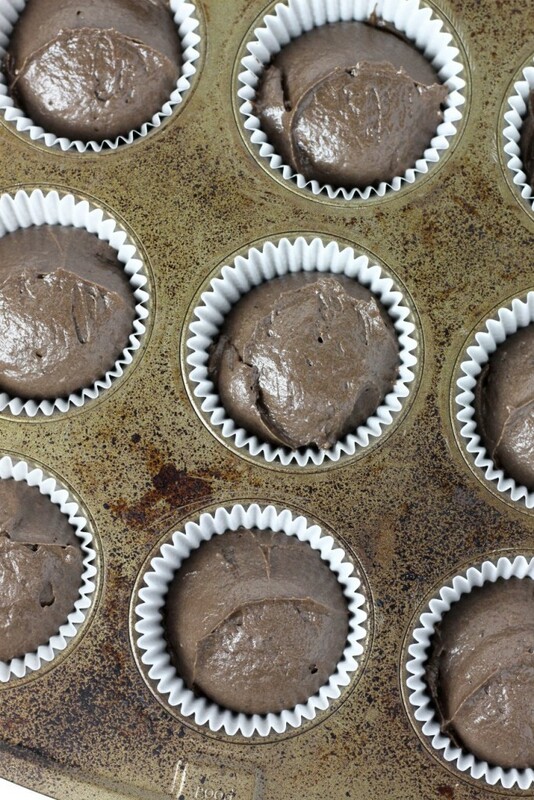 (Normally, you’d want batter drips to stay on top for longer before incorporating). Anyways, since we’ve got a swamp cooler in our house, it’s nearly impossible to whip eggs to anything stiffer than this, so it works well. For me it takes about 8 minutes in a stand mixer with the whisk attachment to reach this stage. Sponge cake feels like magic to me. 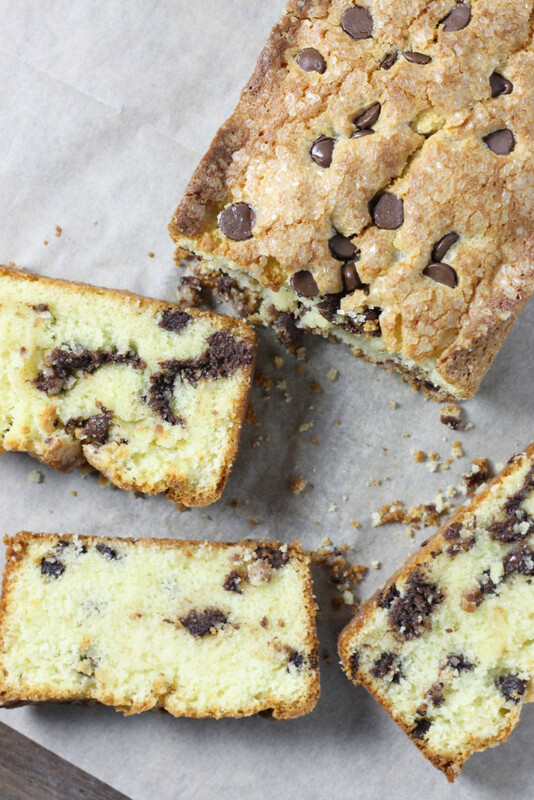 It’s really just eggs, sugar, and flour, and it bakes up into this fluffy, chewy, real life cake. Eggs you guys, they are the magic ingredient, no joke. And so anyways, I’ve eaten literally this entire cake as a stand alone dessert (and also I’ve eaten the whole thing myself). That’s to say, it can definitely stand alone with just a dusting of powdered sugar. 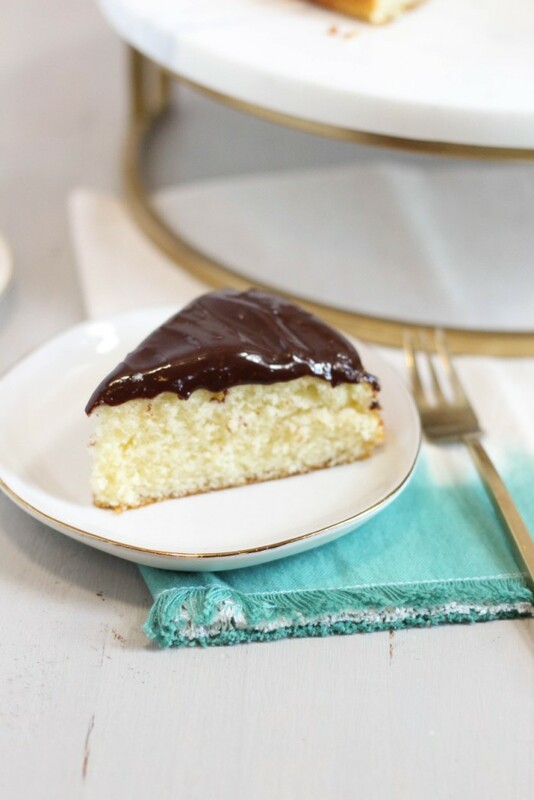 BUT, it’s also great with fruit and whipped cream piled on top, or frosted with chocolate buttercream, or drizzled with a simple icing. Another super nice part of this cake is that it is self-leveling. 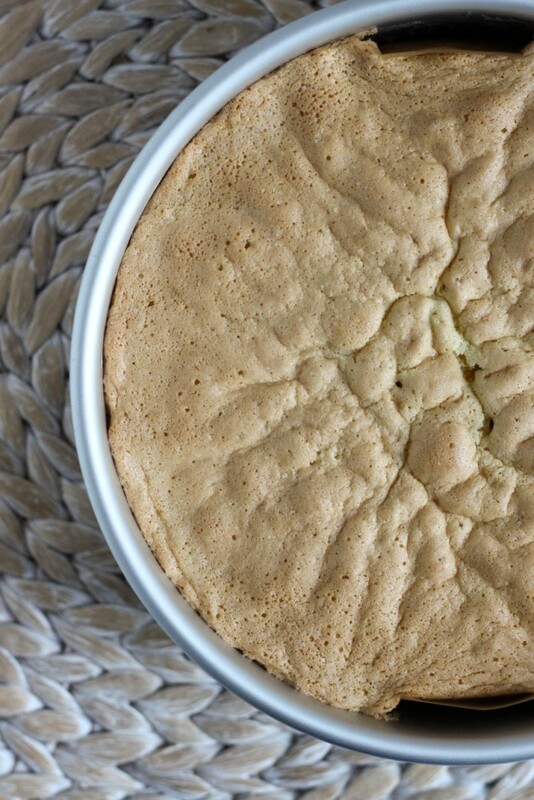 Basically when it comes out of the oven, it should be domed like a normal cake, but as it cools, it will flatten out and should end up with a perfectly flat top and bottom. 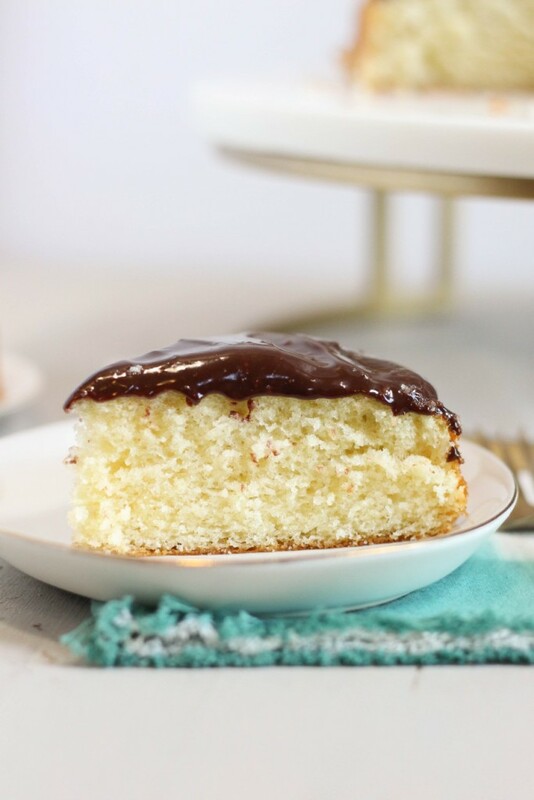 It’s super easy, make it today because why not have cake? 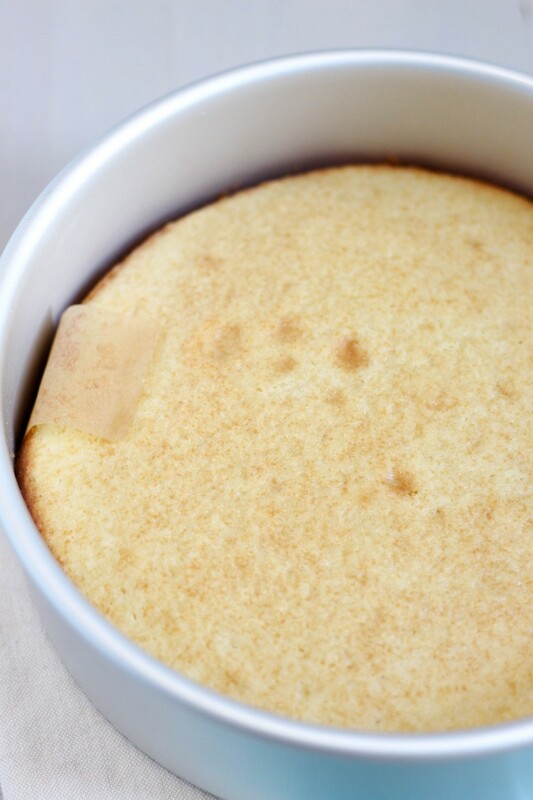 Preheat your oven to 350 degrees, and grease an 8 inch round cake pan, and line the bottom of the pan with parchment paper. Set aside. In a large bowl, beat together the eggs, sugar, salt, and vanilla until thick and fluffy. This should take about 8-10 minutes. When you lift out your beaters, the batter that drips off should sit on top of the batter in bowl for a few seconds before incorporating back in. 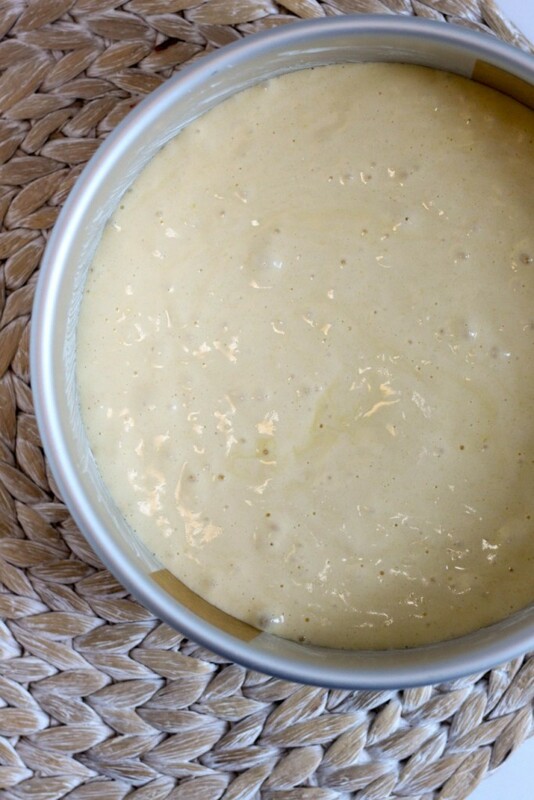 Over a medium bowl, sift together the cake flour and instant pudding mix. Then, sift the mixture again, this time directly over the whipped egg mixture. Using a spatula, gently fold in the flour mixture. Be sure to turn your bowl many times, and scrap through to the bottom of your bowl to ensure that you don't leave any pockets of flour. 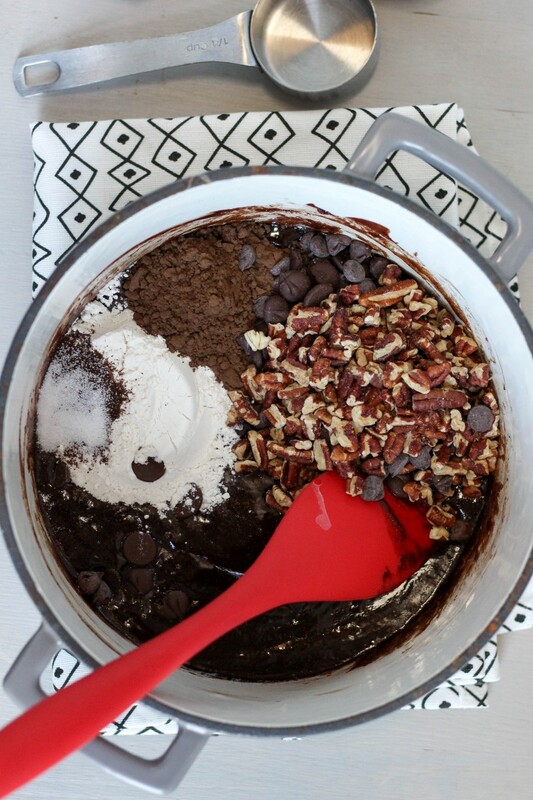 Pour into your prepared pan, and bake for 30-35 minutes, or until a cake tester comes out clean. Cool completely in the pan before using a knife around the edges and turning it out. Garnish as desired. Enjoy! Hey guys! Today I’m doing something a little bit different for my here-and-there series about High-Altitude Baking. 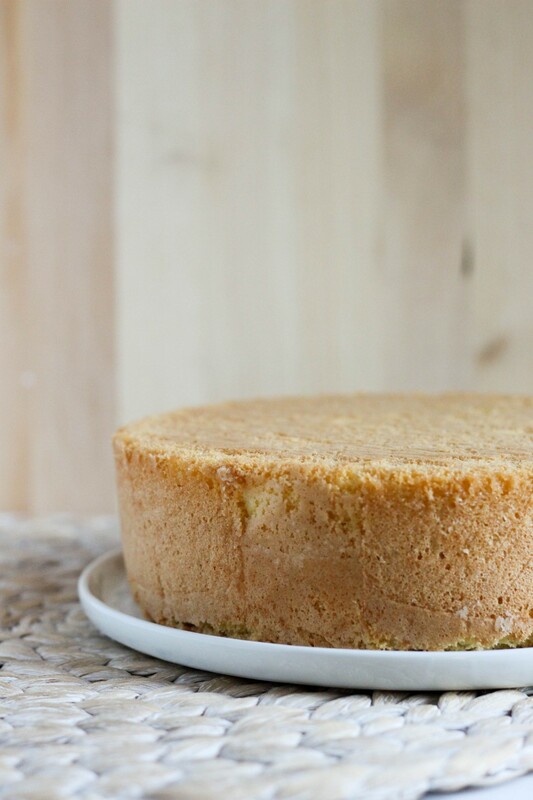 First, if you want to read all the posts that I think have a specific value in high-altitude baking, you can find them in my High-Altitude section. This includes recipes for things that I have found are particularly difficult to bake at altitude, and also a post about common high-altitude baking misconceptions. I have found that there’s some easy changes when it comes to converting a recipe to work wherever you live, and this area is a great place to start! So, onto today’s post. 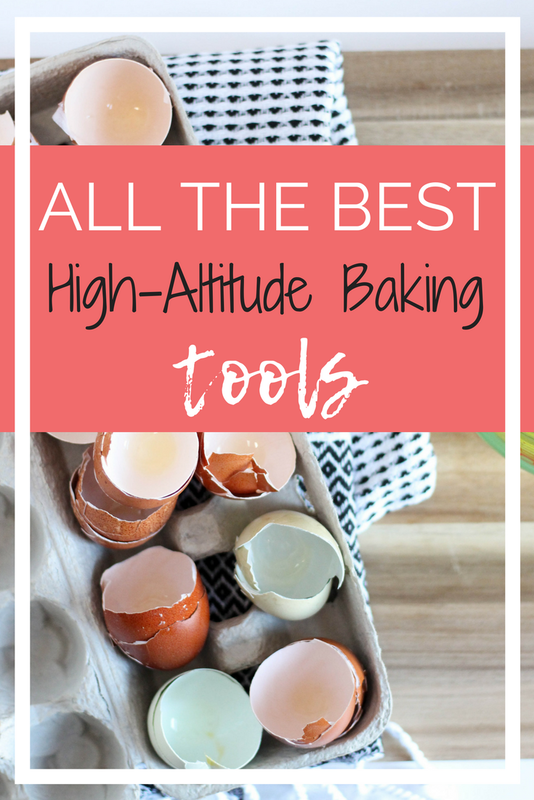 I know you guys have probably seen a lot of posts about best baking tools, or blogger’s favorite baking tools, and trust me, I’ve got some favs. But today I’m going to talk through some of the tools that I find most valuable for high-altitude baking. Listen, I’m not going to lie, it’s NOT all about the tools. I think there’s some easy recipe changes that don’t involve specific tools to make your recipes work, but this list encompasses some of my favorite items that make it easier to make it work up way up here. Instant Read Thermometer: These are pretty cheap, and they make a lot of things easier. Whenever you’re making a Swiss meringue buttercream and need to get the temperature of those egg whites, or if you’re making candy. But where it really shines for baking at altitude is in bread making. You need to make sure your yeast is bloomed at the right temperature to start, and you also may need to check the temperature of the bread once baked to make sure it’s done. Regardless, the absolute easiest choice is an instant read thermometer. I have this one, and it’s simple, affordable, and gets the job done. Non-Stick Baking Spray: I’ve recently started using this Pam Baking Spray, and it’s seriously impressive. It’s the only spray I’ve ever found that actually works for cakes, even intricate bundt pan cakes. 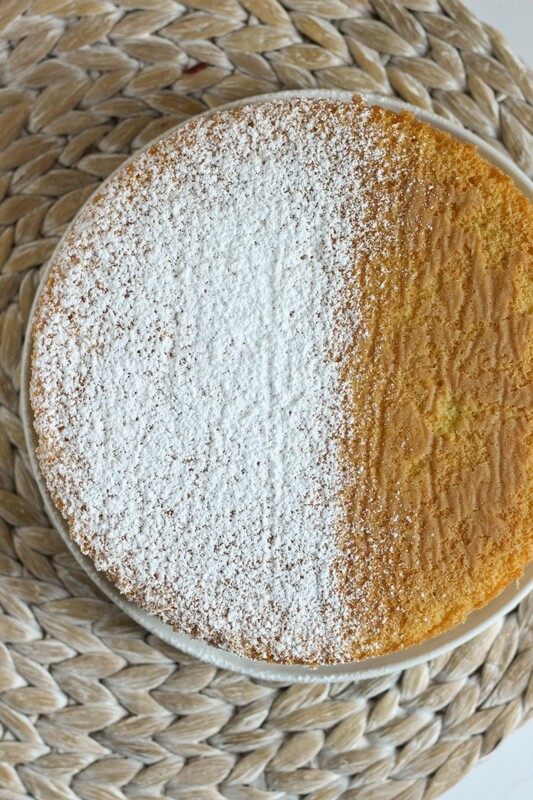 This isn’t something I’ve tested, but there’s a lot of rumors out there that cakes are more prone to sticking to pans in high-altitude areas. Whether it’s true or not, AND whether you’re at altitude or not, cakes that stick to the pan are a serious bummer. Oven Thermometer: I put off buying this for a long time, thinking it didn’t really matter. But once I started to get down to the details with high-altitude baking, it became clear that oven temp is a big deal. You may need to adjust your oven temperature to adapt certain recipes, plus some ovens are CRAZY wrong! In my case, I found that my oven does reach the right temperature, but it takes way longer than it says- about 10 minutes longer than when the preheated ding goes off. Good to know you guys, seriously. Vanilla extract: This is an easy one- of course vanilla is probably the most used extract out there. But it’s good to note that it enhances the flavor even in non-vanilla centered recipes, like chocolate cake for example. Also, since there’s a lot of fluctuation in the vanilla market today, it can be a big deal to find something affordable and flavorful! Instant espresso powder: Again, I use this to enhance the flavor of chocolate desserts on a regular basis. It won’t make things taste like coffee (unless you want it to) and it just gives recipes a bit more depth of flavor sometimes. 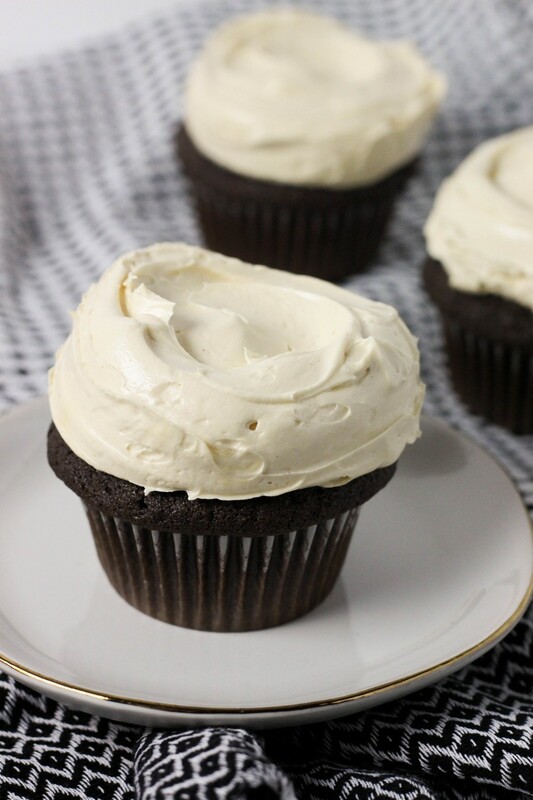 It’s great in oatmeal cookies, chocolate cake and frosting! Dark cocoa powder: Seriously, did I mention chocolate cake issues? It drives me insane! Here’s what I’ve found when it comes to cocoa powder- this option from Hershey’s can be used to equal-swap regular cocoa powder in recipes, so it’s simple, and it offers a lot more flavor. 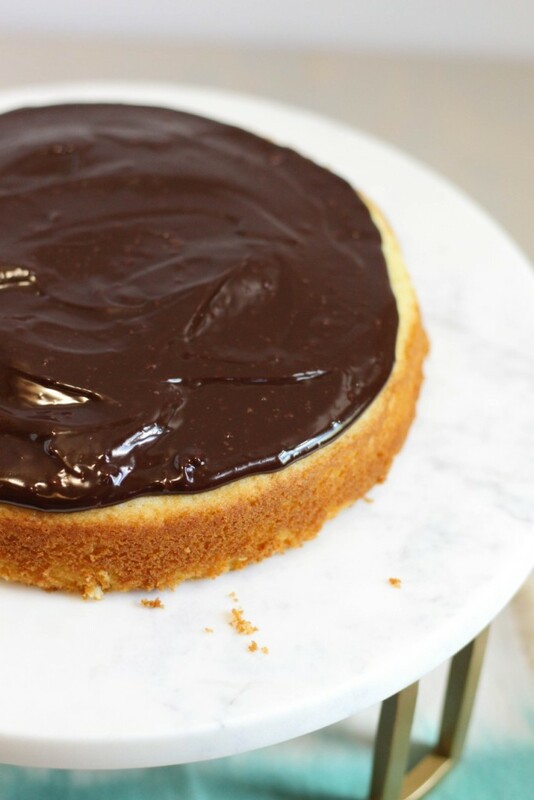 The way I see it, this is how you achieve that strong chocolate flavor you’ve seen in bakeries and boxed mixes when you’re baking from scratch up high. Liquid measuring cup: This is a basic, and you want something that is big enough to easily hold most measurements that you’ll need. That being said, I own them in a ton of sizes- one cup, two cup, four cup, and eight cup. Dry measuring cups: I also own multiple sets of dry cups because okay, maybe I bake too much. Because flour alone is such a big factor in baking at altitude, you gotta get those dry measurements right guys! Alright, that’s my list. 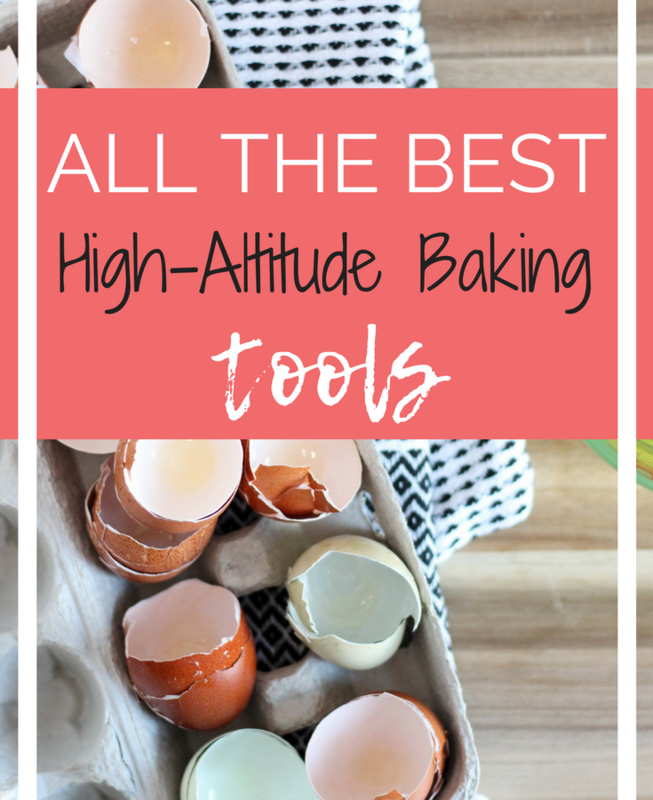 Baking at altitude doesn’t have to be complicated, but having the right tools can make a big difference!